Beat the Summer Heat with Inflatable Water Fun! You won’t find a more exciting and refreshing way to anchor a Community, School or Religious Event or Birthday Party than with a commercial-grade inflatable waterslide rental. Make your event memorable for years to come! 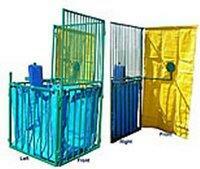 Choose from our large selection of commercial waterslides, water games and water rides. New for 2011! This 24' HIGH WILD WAVE WATERSLIDE is our most thrilling waterslide. Nearly freefall into over 32 feet long slip 'n' slides for a long and wild wet ride. WILD RAPIDS is one of our most popular waterslides.This 18' High WaterSlide is perfect for children and adults of all ages. 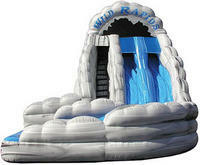 18' HIGH WILD RIDE WATERSLIDE fits in to any Summer Event. 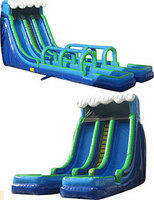 15' TROPICAL RAPIDS WATERSLIDE will bring the islands to you. 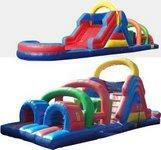 32' DOUBLE LANE JUNGLE RAPIDS SLIP 'n' SLIDE with POOL will cool any hot day. We offer delivery and set-up to all Atlanta Area festival and events, including Children’s Birthday Parties, Summer Camps, Daycares, Churches and Schools. A nominal mileage fee may apply. Click here for a complete mileage fee chart.